In association with the September 2014 phreatic eruption (VEI 1–2) at Ontake Volcano, a syn-eruptive and two post-eruptive lahars occurred in the Akagawa–Nigorigawa River, southern flank of the volcano. The present contribution describes and discusses the contrasting features of the two post-eruptive lahars, which caused a major impact on downstream river morphology, and re-examines the description of the syn-eruptive lahar in the previous study. The first post-eruptive lahar occurred 8 days after the eruption by the rainstorm (October 5, 2014, before the snowy season), and the second lahar was associated with the rain-on-snow (ROS) event on April 20, 2015, in the early spring of the snowmelt season. The October rain-triggered lahar, which can be interpreted as a cohesive debris flow, reached at least ~ 11 km downstream and left muddy matrix-rich sediments with high clay content (10–20 wt% of clay in matrix). The lahar deposits contain hydrothermally altered rock fragments, sulfide/sulfate minerals, and clay minerals and show extremely high total sulfur content (10–14 wt%) in matrix part, indicating source material from the September phreatic eruption deposits. The presence of “rain-triggered” clay-rich lahar and deposits originating from a single small phreatic eruption is important because usually such clay-rich lahars are known to occur in association with large-scale sector collapse and debris avalanches. The April ROS-triggered lahar was caused by the heavy rain and accompanying snow melting. The lahar was dilute and partly erosional and evolved into hyperconcentrated flow, which left fines-depleted sandy and gravelly deposits. Despite these lahars that originated from the same volcanic source and occurring within a 7-month period, the flow and resulting depositional characteristics are totally different. These different types of lahars after a single eruptive event need different simulations and mitigation of lahar hazards with timing (season) of the lahar onset. In comparison with rainfall intensity, snow-melting rate, and the contrasting lahars occurred in 2014/2015, it is postulated that the generation, size, and types of lahars can vary with the timing of eruption, whether it happens during the pre-snow season, snow season, or rainy season. On September 27, 2014, Ontake Volcano in central Japan confronted mountaineers with an unpredicted small-scale phreatic eruption (VEI 1–2: Maeno et al. 2016) and caused 63 fatalities (including 5 missing) at the summit. Studies about the eruption and the tragedy have addressed the processes and mechanism of the eruption itself (e.g., Oikawa et al. 2016). Also, further concerns and interests immediately after the eruption were about future eruptions and their prediction: whether the eruption would evolve into magmatic explosive phase. However, there was another concern for lahar hazards with snow/ice meltwater (Major and Newhall 1989; Pierson et al. 1990; Manville et al. 2000; Waythomas 2014) such at the seasonally snow-clad Ontake Volcano. Further eruptions could trigger lahars through rapid snowmelt by hot pyroclastic density currents. Even without a new eruption, lahars remobilizing the primary September eruption deposits in upslope areas could be triggered later by heavy rain or by warm rainstorm on winter snowpack. In addition, an earthquake-triggered lahar is always a potential hazard in this region, as evidenced by the lahar triggered during the Naganoken-Seibu earthquake on September 14, 1984 (Matsuda and Ariyama 1985; Endo et al. 1989), which initiated as flank collapse of southern part of the edifice. The resulting lahar in the Denjogawa and Nigorigawa Rivers (Fig. 1a) and other landslides caused 29 fatalities. Lahars and other sediment-laden flows are serious hazards because they can cause rapid aggradation and widening of rivers from proximal to distal areas of volcanoes, inundate communities, and destroy infrastructure (Smith 1991; Newhall and Punongbayan 1996; Kataoka et al. 2009; Pierson and Major 2014). This paper focuses on three lahars generated at Ontake Volcano within a 7-month period, each triggered by a different mechanism: a phreatic eruption, heavy rainfall, and rain-on-snow event (hereafter ROS for “rain-on-snow”: Kattelmann 1985, 1997; Sui and Koehler 2001; Pradhanang et al. 2013). This paper further highlights that at Ontake Volcano, the generation, size, and types of lahars are dependent, in part, on the timing and type of eruption with respect to the presence of seasonal snowpack. Ontake Volcano (3067 m a.s.l. (above sea level), at summit Kengamine peak; 35°53′ 34″N, 137°28′49″E) is located on Honshu Island at the border of Nagano and Gifu Prefectures (Fig. 1). During the Holocene epoch, before the 2014 eruption, Ontake Volcano has erupted at least 21 times; most have been phreatic and three have occurred within the last 50 years. The first recorded (witnessed) historical eruption at Ontake was a phreatic eruption which occurred on October 28, 1979, from vents in Jigokudani and Haccho-tarumi (e.g., Soya et al. 1980). After the 1979 eruption, small-scale phreatic eruptions again occurred in May 1991 and March 2007 from Haccho-tarumi crater and resulted in ashfall deposition nearby the vent only. Oikawa et al. (2014) reported the presence of at least 13 phreatic eruptions during the last 7500 years before the 1979 eruption and 5 magmatic eruptions during the Holocene. Since the traces of small-scale eruptions including phreatic eruptions in geological records are limited, the eruptive records and associated lahar history of Ontake Volcano still need to be examined in detail. On September 27, 2014 (11:52 a.m. Japan time), Ontake Volcano erupted suddenly with a very short precursor of tremor and edifice tilting that began 11 min before the eruption (Oikawa et al. 2014; Maeno et al. 2016). The active eruptive vents were in Jigokudani valley (Fig. 1a) with the eruptive column reaching ~ 7.8 (or 5) km high above the vents (Sato et al. 2016). The 2014 eruption included low-temperature pyroclastic density currents induced by the collapse of the volcanic plume that rose up to 300 m above the vents. The currents mainly flowed on the southern and western slopes of the volcano (Yamamoto 2014; Maeno et al. 2016) although the actual thickness of deposits confined to valleys still remains unknown. The eruption was phreatic without any juvenile materials. The ejecta consist of fragmented gray andesite and altered andesite with sulfide and sulfate minerals (Maeno et al. 2016; Minami et al. 2016). The ashfall distribution is more extensive than that of the 1979 eruption (Oikawa et al. 2014; Takarada et al. 2016). The volume of eruption deposits is estimated as 0.7–1.3 × 106 m3, suggesting a very small-scale VEI 1–2 eruption (Maeno et al. 2016). Most of the ashfall deposits are distributed east of the vents because of the prevailing westerly winds (Fig. 1a: Oikawa et al. 2014; Maeno et al. 2016; Takarada et al. 2016). Aerial photographs suggest a thin layer of ash mantles the southern slope (Oikawa et al. 2014; Maeno et al. 2016; Takarada et al. 2016). Fumaroles have been commonly observed around vents in the Jigokudani valley before and after the eruption. On the syn-eruptive lahar, aerial photographs taken around the Jigokudani vents approximately 2–4 h and 1 day after the eruption (Kaneko et al. 2016) indicate that a relatively small of volume of mud slurry (mudflows) was expelled from the vents. Sasaki et al. 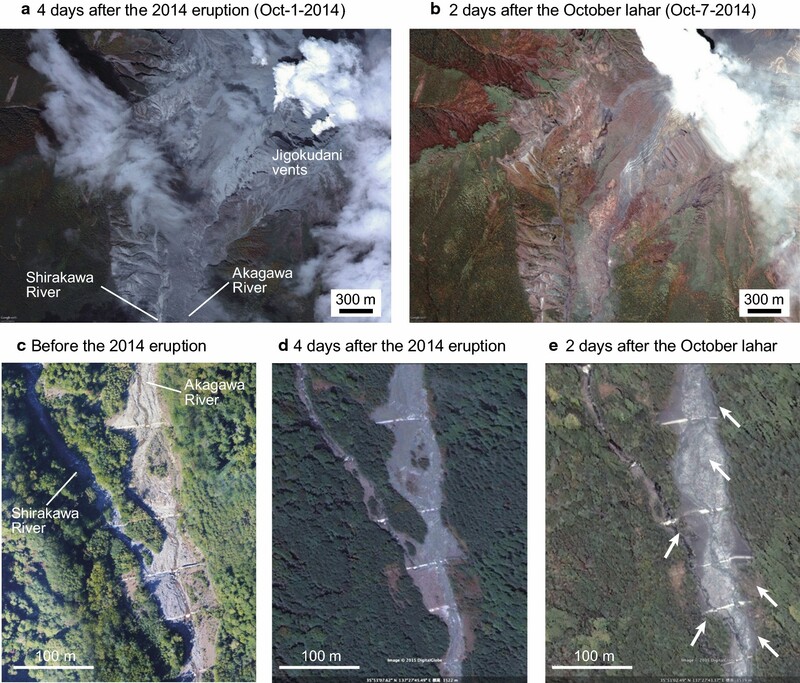 (2016) reported the distribution of mudflow deposits from the vents to 5 km downstream in the Akagawa River, southern slope of the volcano, on the basis of aerial photographs taken 1 day after the eruption (Fig. 1b). They interpreted from the aerial photographs that the mudflow expelled from the vents directly and continuously travelled 5 km to the Akagawa River as a lahar. However, uncertainty about these observations arises because the interpretation was not supported by any field evidence. Alternative possibility for the origin of the syn-eruptive lahar, such as transformation of pyroclastic density currents, has not been discussed by the previous studies. The Nigorigawa River system consists of two main tributaries in the upstream area; Akagawa River and Shirakawa River (Fig. 1a). The two rivers run parallel on the volcanic slope, although only the Akagawa River catchment holds active Jigokudani vents in the head of the river valley. Ontake Volcano is under a temperate climatic condition with seasonal snow cover from November to May around the top of the mountain. The annual maximum snow depth, the annual mean air temperature, and the annual precipitation are 76 cm, 7.4 °C, and 2065 mm, respectively, at the Kaidakogen weather station (1130 m a.s.l. ), located ~ 11 km northeast of the summit of the volcano and operated by Japan Meteorological Agency for 30 years from 1981 to 2010. In order to understand the amount of water input to the Nigorigawa River catchment, the present authors carried out meteorological observations at Tanohara (on the southeastern slope, 2190 m a.s.l. ; Fig. 1a), which is quite close to a precipitation gauge operated by Japan Meteorological Agency. Obtained rainfall data and rate of snowmelt are based on the measurements of energy balance components at the snow surface (e.g., DeWalle and Rango 2008) during the winters of 2014/2015 and 2015/2016 (Fig. 2). After the eruption on September 27, two typhoon events caused > 100 mm of cumulative rainfall on October 5 and 13, 2014, before any snowpack had accumulated (Fig. 2a). Snow started to accumulate at the end of November, with a maximum thickness of 2 m by the middle of March, which was completely melted on April 20, 2015, at the Tanohara observation site (Fig. 2). At least three ROS events resulting in major stage changes during the snow-melting season were observed in records of a time-lapse camera at the Akagawa River set by the authors (Fig. 2a and the supplementary movie file as in Additional file 1). Wire sensors, which were set up for a debris flow alert in the Nigorigawa River system (Fig. 1), were activated only by two lahar events on October 5, 2014 (second rainstorm after the eruption), and on April 20, 2015 (the last ROS). This means that the rest of heavy rainfall and ROS events caused no or minimal mass transport to have resulted in any significant geomorphological changes to the river during the period. After April 20, 2015, to the end of observation period in 2016, rainstorms as well as ROS conditions were observed, but major lahars did not occur. Wire sensors did not detect any lahars after the ROS-triggered lahar on April 20, 2015. Several analyses, in the field and in laboratories, were performed in this study. Analyses for this study consisted of (1) geological and sedimentological surveys to identify lahar deposits, (2) river image capturing by a time-lapse camera over a 13-month period from November 2014 to November 2015, and (3) grainsize of lahar deposits, and (4) XRF (X-ray fluorescence) and XRD (X-ray diffraction) analyses of lahar component particles. 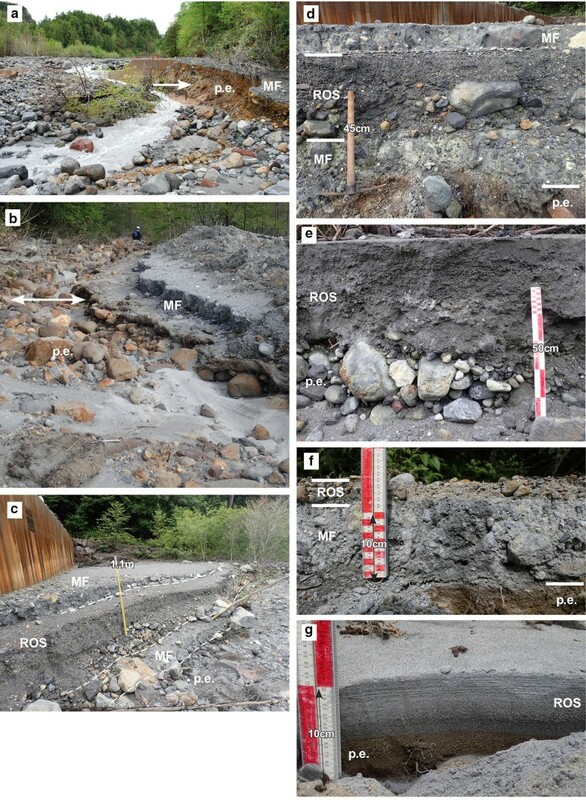 Distribution, thickness, sedimentary facies, and lithological characteristics of lahar deposits in the Akagawa–Nigorigawa River valley were described in the field. Regular monthly to bimonthly field survey after the eruption enabled the identification of new lahar deposits with timing of their emplacement, and to document the drastic geomorphic changes of the Akagawa–Nigorigawa River over the period of the study. Since November 2014, the authors deployed an automatic camera (time-lapse camera) in the Akagawa River at 4.7 km downstream from the vents (Fig. 1: nearby Loc. 1227 at the check dam) to observe changes in river discharge, turbidity, and geomorphology (the supplementary movie file in Additional file 1). The camera captures one shot every 10 min during daytime. Samples for grainsize analysis were collected only for those materials that are finer than approximately 10 cm in size. Lahar deposits contain larger clasts (tens of cm to 1 m in size); therefore, the samples represent predominantly matrix fraction of the whole sediments. Sample quantities of about 200–1000 g of dry weight for meter-thick deposits and less than 100 g for decimeter- to centimeter-thick deposits were collected. Sandy and gravelly samples were dry-sieved and separated by grain fractions in a phi scale, whereas muddy sediments were wet-sieved after dried samples (weighted) were soaked in water medium, and were separated by a sieve with a mesh size of 63 μm. Grains larger than 63 μm (sand and gravel) were again dry-sieved in a phi scale. Petrography of sieved samples (1/4–1/8 mm fraction) was carried out under binocular and petrographic microscopes. Grainsize for smaller than 63 μm (i.e., mud fraction) was examined by a laser grainsize analyzer, Malvern Mastersizer 3000 at Niigata University. Five portions were randomly collected from each sample, and each portion was measured five times (therefore a total 25 runs for one sample) with duration of 15 s for each run. Averages of the total runs represent grainsize for each sample. XRF analyses for powder-pressed pellets of bulk samples of ashfall, lahar, and pre-eruptive fluvial deposits were performed with Rigaku RIX1000 and RIX2000 at Fukushima University. The accelerating voltage and tube current were 50 kV and 50 mA. Data for major element and total sulfur (as SO3) content are semiquantitative by the FP (fundamental parameter) method with a standardless technique (Takase and Nagahashi 2007). Sulfur content in each sample is high enough to discuss comparison among individual samples. Trace element contents were quantified by the calibration curve method (Nagahashi and Nakazawa 2016). For muddy sediments, XRD analysis (by Rigaku Ultima IV at Niigata University) was performed to understand the mineral composition and to discuss the origin and relation of the 2014 phreatic eruption with lahars. Samples were prepared for bulk analysis (powdered) and for fine fraction (clay mineral) analysis after separation by hydraulic settling and centrifuge. Samples for clay mineral analysis were measured as (1) oriented and (2) heated at 400 and 550 °C conditions. Some samples were treated with ethylene glycol and HCl to identify the minerals overlapping in certain cell parameters. Measurement conditions were of CuKα radiation, 40 kV and 40 mA, and scanning speed of 2° per minute. The first rainstorm event after the eruption occurred on October 2–3, 2014, with total 52.5 mm precipitation (corrected value by wind velocity data) recorded on the rain gauge at Tanohara. However, this rainstorm with maximum 6.9 mm/h did not trigger a lahar. The second rainstorm associated with a typhoon (the 18th typhoon in year 2014 in Japan) was 8 days after the eruption, on October 5, and did trigger a lahar. The lahar was detected in the Nigorigawa River at 4:59 p.m. based on a wire-sensor alert system at 6.5 km from the vents (Fig. 1) deployed by the Forestry Agency at the Kiso Office (Hayashi et al. 2015, and public announcement by the Forestry Agency, Kiso Office: http://www.rinya.maff.go.jp/chubu/koho/ontakesan/pdf/141105-ontaketaiou.pdf). The wire sensor was placed at 1.0–1.4 m above the riverbed. Cumulative rainfall from early morning to 5 p.m. was 47.5 mm, and total precipitation during the day rose to 104.4 mm (Fig. 2). The peak hourly precipitation was 15 mm/h during the hour from 4 to 5 p.m. A third rainstorm on October 13–14 was again associated with a typhoon. Although heavier rainfall of total 120 mm during the day and intensive rain over 6 h (exceeding 10 mm every hour) were recorded, the rain event did not trigger a lahar. Aerial photo-images captured by the Geospatial Information Authority, Japan, and Google Earth images provide evidence that the first and second rainstorms and the lahar caused high degradation and deposition with major geomorphic changes on the southern flank of the edifice and in the river courses (Fig. 3). On October 1, before the rainstorms, gray areas near the vents and farther downslope indicate mantling by ash. Images of the river valley, where a pyroclastic density current descended, also show mantling by ash (Fig. 3a). Images taken 2 days after the lahar (on October 7) show extensive erosion of the ash on the southern flank, with underlying brown to reddish brown altered rock and deposits then exposed by the rain and lahar (Fig. 3b). 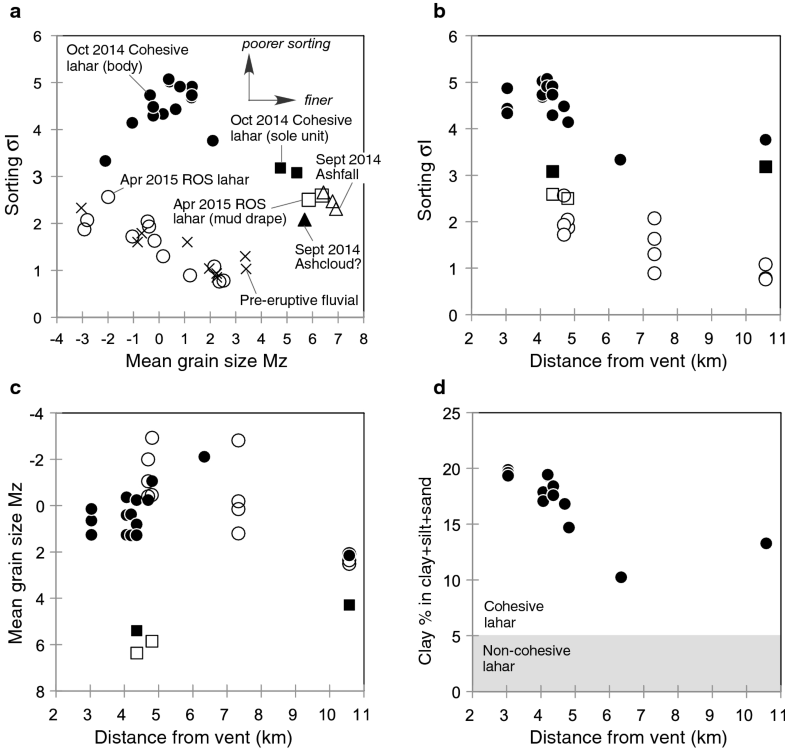 These changes correspond with the aerial observation by Oikawa et al. (2015), in which they reported disappearance of a mound of pyroclastic deposits in the Jigokudani area after these rainstorms. The river channel in downstream areas also shows changes. Comparison of aerial photographs of the confluence area of the Akagawa and Shirakawa Rivers (Fig. 3c–e) taken in 2013 and after the 2014 eruption (on October 1 and 7) reveals major geomorphological changes (erosion of riparian forests and bars and deposition at overbank) caused by the lahar. Aerial photographs and field investigation revealed that overbank flows reached the confluence with the Shirakawa River (Fig. 1b). The lahar deposits with boulders were distributed down to the confluence of Nigorigawa and Denjogawa Rivers, and fine-grained flows travelled further downstream (Fig. 1b, c: Hayashi et al. 2015). The total volume of the October lahar deposits is roughly estimated as 2.9 × 105 m3 (Table 1). The October lahar left deposits not only in the main river channel, but also spilled sediments over banks onto side terraces (Figs. 4, 5). The deposits were recognized between 3 km from the vents in Jigokudani (Loc. S118 in Fig. 1b) and the downstream end of the Nigorigawa River (10.5 km from the vents: Loc. 1207, Fig. 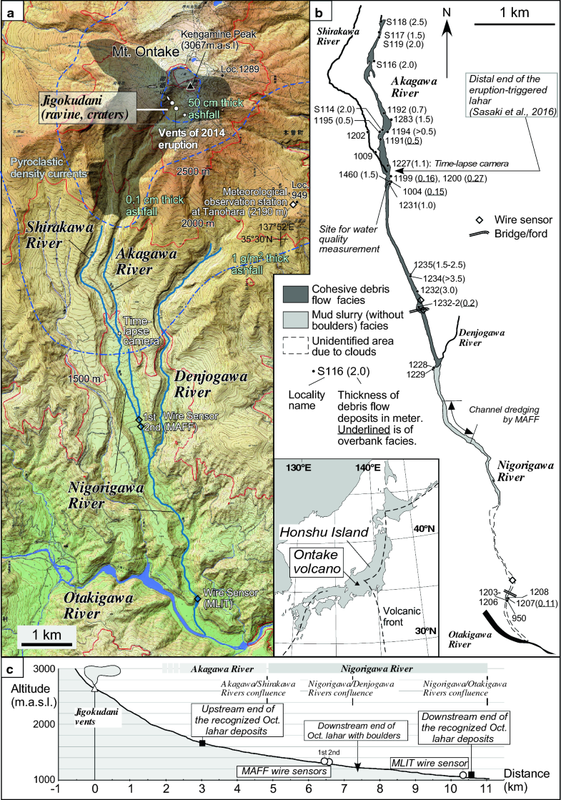 4i) where the larger Otakigawa River joins (Fig. 1). The gray-colored fine ash deposit (possibly derived from ash cloud of the pyroclastic density current) overlain by the lahar deposits is recognized at Loc. S118. The ash deposit mantles underlying pre-eruptive deposits. Thickness of the lahar deposits in the Akagawa and Nigorigawa Rivers varies between 1 and 3 m for in-channel facies (Fig. 4c–e) and 0.1 and 0.5 m for overbank facies (Fig. 4g–i). In-channel facies is defined as deposits that rest directly on fluvial gravel, whereas overbank deposits overlie soil and vegetation developed on banks and terraces (Figs. 4a, 5, 6a, b). Occasionally, run-up deposits on sidewall of the valley up to 1 to 1.4 m high can be observed (Fig. 4c). Mud lines were left on trees and leaves. On the surface of deposits wrinkles and ridges formed by compression are present (Fig. 4b). Overbank deposits are identified on a sabo-dam (check dam at Loc. 1227) 3 m above its base (Fig. 5a). Facies, texture, and composition of in-channel and overbank deposits (components less than 8 mm) are usually similar in an outcrop scale (vertical and lateral), and from the proximal to distal locations, however, thickness and content of clasts larger than 8 mm decreased toward downstream (Figs. 4, 5, 6a, b). The presence of boulders in the deposits diminishes beyond the confluence with the Denjogawa River where the valley widens. The lahar deposits are muddy matrix supported, massive, and unstratified (Fig. 4). Approximately 40 days after the lahar event (November 12, 2014), the deposits were still fluidal, i.e., wet, viscous, and swampy, but they had become hard when the authors revisited the deposits 7 months after deposition. Locally 2-cm-thick sole layers (matrix material without clasts) occupy the base of sequence. The matrix is very poorly to extremely poorly sorted (σI = 3 to 5; Fig. 7 and Table 3 in Appendix 1) with a wide range of grainsize distributions, but always characterized by the presence of a mud fraction (silt + clay) largely > 20 wt%. The poor sorting nature does not change with distance (Figs. 6a, b, 7). Pyrite grains in matrix are observable in hand specimens. Yellow-colored patches, probably of native sulfur and/or precipitation from pore water in relation to dissolved sulfide and sulfate minerals, are also observed. The deposits contain granules to cobbles; however, 30-cm-sized to 1-m-sized boulders are also included. Clasts are mainly composed of unaltered andesite with subordinate amounts of white-colored hydrothermally altered rocks of angular shape up to 3 cm in diameter. Juvenile materials such as pumice, scoria, and fresh glass shards are not recognized. Usually, sediments are porous and < 1 mm spherical voids are present (Fig. 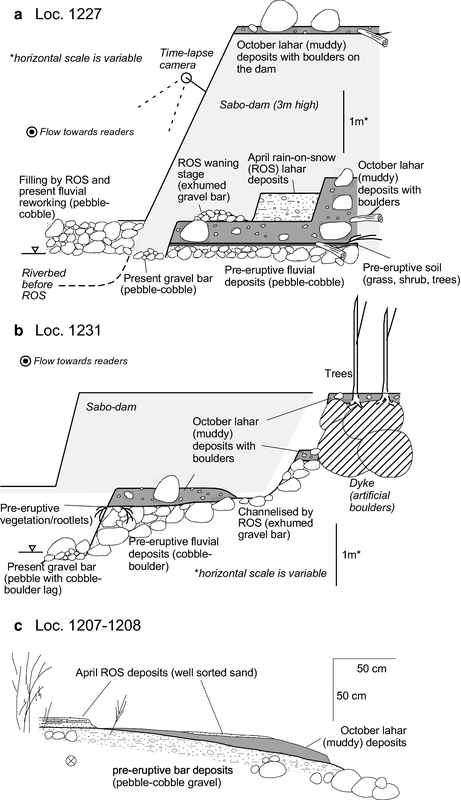 4f) that suggest air bubble vesicles within debris flow deposits (Fisher and Schmincke 1984, page 306; Harpel et al. 2013). Standing trees, wood logs, and shrubs that had been part of the riparian forests at the time of eruption were incorporated with the lahar deposits. Poor sorting, massive facies, and trapped air in the matrix of the October lahar deposits, as well as very high clay content within sand + silt + clay fraction of the deposits (10–20%: Fig. 7d, Table 3 in Appendix 1), indicate a cohesive debris flow (Scott et al. 1995; Vallance and Scott 1997; Vallance and Iverson 2015). The clay content slightly decreases toward downstream (Fig. 7d). No major facies changes in vertical sections and proximal to distal sections (Fig. 6a, b) indicate the absence of flow transformation into hyperconcentrated flow and/or sediment-laden streamflow during flow. The absence of flow transformation is more common in cohesive debris flows than cohesionless debris flows (Scott et al. 1995; Vallance and Scott 1997; Sohn et al. 1999). Matrix sediments of 1/4–1/8 mm fraction consist mainly of white hydrothermally altered lithic fragments sometimes attached to smaller pyrite aggregates, and feldspars. Brown-colored lithic fragments, quartz, and pyrite are present. Trace amounts of orthopyroxene and clinopyroxene are recognized. Bulk chemistry indicates that the October lahar deposits contain 10–14 wt% sulfur (Fig. 8, Table 4 in Appendix 2), which is conspicuously higher than that of pre-eruption fluvial deposits (0.3–4.1 wt%). Mineral assemblages identified by XRD comprise quartz, plagioclase, cristobalite, pyrite, gypsum, anhydrite, alunite, pyrophyllite, smectite, illite, kaolin group minerals (7Å), illite/smectite mixed layer, and chlorite (Table 2). Some of these are typical of eruption material derived from hydrothermally altered areas in Japanese volcanoes (Ohba and Kitade 2005). 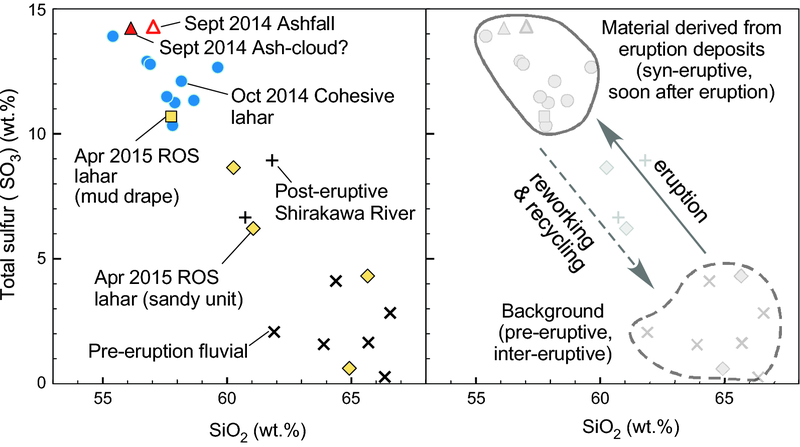 The composition of the lahar samples is similar to that of primary ashfall deposits of the 2014 eruption at Ontake (Table 2; Minami et al. 2016) and indicates that lahar deposits contain primary eruption (ashfall and pyroclastic density current) deposits derived from hydrothermally altered materials on surface and/or beneath the vents. According to the public announcement by the Forestry Agency (http://www.rinya.maff.go.jp/chubu/press/kouhou/150420_2.html), the debris flow alert system was again activated by a flow at 8:08 p.m. on April 20, 2015. The wire sensor at the time was set at almost the same place to the previous site (Fig. 1), but at slightly higher position at 1.4–2.0 m above the riverbed than when the October 2014 lahar was detected. At the Tanohara rain gauge (at 2190 m. a.s.l. ), 278 mm of heavy rain was observed from 7:00 a.m. on April 20 to 3:00 a.m. on April 21 (Fig. 2b). The warm, humid, and windy weather condition was due to an extratropical cyclone. It caused rainstorm and snow melting, and hence, the snowpack around the weather station completely disappeared by the end of the rainstorm (Fig. 2a, b). The ROS event caused the snowmelt of 120 mm water equivalent, and thus, the total water input (rainwater + meltwater) was 398 mm. Cumulative rain + meltwater until lahar initiation (~ 8 p.m.) was 234 + 98 mm over 13 h, and peak input of 35 mm/h occurred during the period from 2 p.m. to 6 p.m. Snow depth at Tanohara became less than 10 cm after 6 p.m. The rate of water input was sufficient to trigger a lahar. The increase in flow discharge in the Akagawa River was observed by the time-lapse camera records (Fig. 1: nearby Loc. 1227, and supplementary movie as Additional file 1) although the peak flow at night could not be recorded. Bank erosion by the ROS-triggered lahar was mainly in the upstream part of the Akagawa River (Fig. 9a). The preexisting depositional sequences emplaced by the October muddy lahar deposits and pre-eruptive terrace deposits were highly eroded and exhumed by the ROS lahar flow (Figs. 5b, 9a, b). Locally original riverbed was filled with sand and gravel causing > 1 m aggradation. At Loc. 1227, where the time-lapse camera was installed, the lahar flow partly eroded the October lahar terrace and left new lahar deposits with 50 cm thickness (Figs. 5a, 9c, d). The authors’ regular ground survey confirms that there was no relevant deposit on April 15, 2015, but the presence of the ROS lahar deposits was confirmed on May 19 (Fig. 9c, d). The camera records and meteorological observations at Tanohara provide evidences that there were no ROS major flood events after April 20 to May 19. Therefore, the sedimentary sequence observed on May 19 displays the ROS-triggered lahar deposits. The ROS lahar deposits show crude horizontal stratifications and/or low-angle cross-stratifications (Figs. 6a, b, 9d, e) at Loc. 1227 (~ 5 km from vents) and Loc. 1228–1229 (7 km). The sedimentary facies is indicative of hyperconcentrated flow deposits (Smith 1986; Pierson 2005). The deposits mainly consist of very coarse sand to granules with medium sand and fine pebbles. They are moderately to poorly sorted (σI = 0.9 to 2.6) and depleted in mud (Figs. 6a, b, 7, and Table 3 in Appendix 1). Clasts in lahar deposits are mainly of andesite. They are mostly round, and some clasts have weathering (oxidized) rind indicative of entrainment of exposed river gravel and/or terrace deposits during flow travelling. Angular fine pebbles to granules, in white color, of hydrothermally altered rock origin, are also present. At the Loc. 1199, the ROS lahar deposits, directly overlying the October lahar deposits, are 3–7 cm thick (Fig. 9f). Gray mud drapes, less than 1 cm thick, are locally observed on the top of the sandy ROS lahar deposits (Fig. 6a, Loc. 1199). The distal lahar deposits (10.5 km from the vents), 2–7 cm thick, consist of relatively better-sorted sand with parallel lamination (σI = 0.8: Table 3 in Appendix 1, Figs. 6b, 7a, b, 9g), indicative of upper flow regime sedimentation under a normal streamflow condition (Allen 1982; Smith and Lowe 1991). The deposits directly overlie the October lahar and pre-eruptive fluvial bar deposits (Figs. 5c, 6b). Sorting values (σI) and mean grainsize of the lahar deposits decrease with distance (Fig. 7b, c). The thickness of the ROS lahar deposits is clearly less than that of the October lahar deposits. Therefore, the total volume for the deposits is smaller than that of the October lahar. On the other hand, the total discharge (water input + sediment) of the ROS lahar must be larger because of the highly erosive nature of the flow and extremely large water input in the catchment. Matrix sediments of 1/4–1/8 mm fraction comprise gray, brown, white angular to sub-angular lithic fragments and fresh angular feldspar grains. Pyrite grains as well as white hydrothermally altered lithic fragments attached to smaller pyrite aggregates are found, but are less prominent than those in the October lahar deposits. Locally well-rounded semitransparent mineral grains (weathered feldspars) are present. Trace amounts of orthopyroxene and clinopyroxene grains are recognized. The total sulfur content in the ROS deposits varies from 0.6 to 8.7 wt%. The value is intermediate between those of pre-eruptive fluvial deposits (< 4.1 wt%) and October lahar deposits (> 10 wt%: Fig. 8 and Table 4 in Appendix 2). The only exception is found from the mud drape part, which contains 10.7 wt% of sulfur. Mineral assemblages for the mud drapes of ROS deposits examined by XRD show similarity with those in the October lahar deposits, such as quartz, plagioclase, cristobalite, pyrite, anhydrite, alunite, pyrophyllite, smectite, illite, kaolin group minerals (7Å), illite/smectite mixed layer, and chlorite (Table 2). No typical cohesive debris flow deposits by the October lahar could be observed during the ground survey in the upper reach of the Shirakawa River. There was a post-eruptive deposit consisting of three units in ascending order (Fig. 6c: Loc. 1202): (1) blue-gray- to gray-colored muddy deposit with less than 1 cm thickness derived from initial ashfall reworking at the bottom; (2) a 10-cm-thick, parallel to cross-laminated sandy unit of probable flood deposits on October 5; and (3) washed (well-sorted) 4-cm-thick sand unit, of ROS-related small-runoff origin, occupying the topmost sequence. 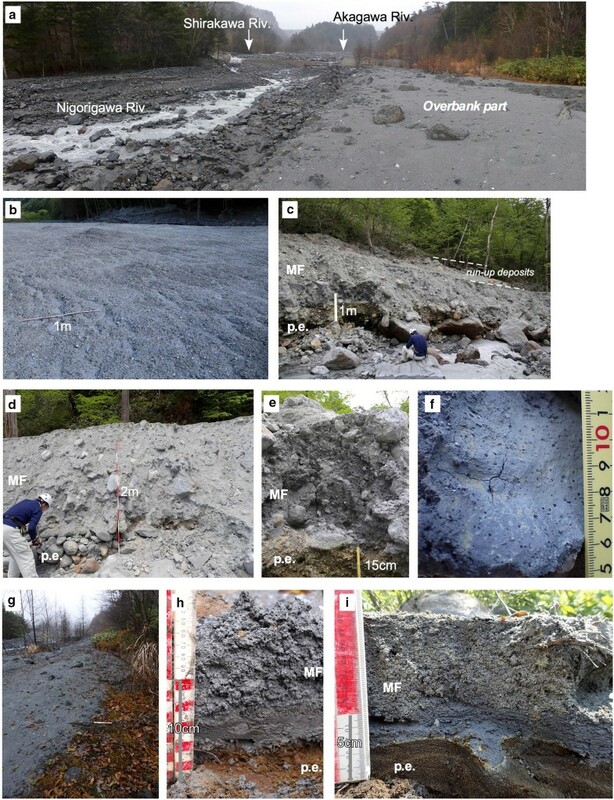 Pre-eruptive fluvial (some terraced) deposits in the Akagawa, Shirakawa, and Nigorigawa Rivers are described and analyzed similarly in order to compare with lahar event deposits (Fig. 6a–c and Table 3 in Appendix 1). They basically comprise well-rounded to sub-rounded andesite clasts (pebble to boulder) with sand matrix as parts of gravel and sand bars within channels. Bulk chemistry shows low sulfur content (0.3–4.1 wt%: Fig. 8 and Table 4 in Appendix 2). Sandy matrix sediments in 1/4–1/8 mm fraction comprise mainly reddish brown to brown color lithic fragments with subordinate amounts of feldspar and trace amounts of orthopyroxene and clinopyroxene. The air-borne survey (Sasaki et al. 2016) indicates a syn-eruptive lahar, which occurred adjacent to the Jigokudani vents and travelled about 5 km downstream. The lahar trigger was initiated by (1) expelled mud slurries from vents combining to form a lahar (Sasaki et al. 2016) and/or by (2) a pyroclastic density current travelling down to the head of the Akagawa River and transforming into a lahar. Despite the possibility of the lahar derived from a pyroclastic density current, Sasaki et al. (2016) concluded that relatively long runout of the muddy lahar required it to originate directly from the vents. The detailed description of two post-eruptive lahar deposits by the present study reveals that the impact of the syn-eruptive lahar was limited and smaller than that discussed in Sasaki et al. (2016). Their ground survey was carried out for 10 months (i.e., long after the April ROS-triggered lahar event) after the eruption. They observed and took samples of what they considered as the syn-eruptive lahar deposits from Sites A, B, C, and D (Sasaki et al. 2016). These localities, which are situated near to Loc. 1192, S114, 1227, and 1232-2 in the present study, respectively, were already impacted by the October and April lahars. The Site D is even outside of the distribution of the syn-eruptive lahar according to the air-borne survey. The 1.2 × 105 m3 volume proposed for the syn-eruptive lahar deposits is overestimated by the representative deposit thickness of 1 m (Sasaki et al. 2016), because the thickness represents that of the October lahar deposits. The syn-eruptive mud slurry had to be very thin, on the basis of oblique aerial photographs taken immediately after the eruption (Figure 3e in Sasaki et al. 2016). A field photograph (Figure 5b in Sasaki et al. 2016) taken during ground survey by the Forestry Agency on October 2, 2014, just before the October 5 lahar confirmed thickness of the syn-eruptive deposits to be less than 10–15 cm, and volume is reassessed as < 1.2–1.5 × 104 m3. Other photographs (Figure 5a, d–h in Sasaki et al. 2016) taken during the survey of 10 months after the eruption show only top surfaces of the deposits, i.e., the overbank facies of the October lahar deposits. This means that these photographs do not indicate the syn-eruptive lahar deposits, which should be appeared in the lower part of the depositional sequences. Thus, they described the October rain-triggered lahar and its deposits as the syn-eruptive ones. Most of the syn-eruptive mud slurry deposits were probably buried and/or degraded by post-eruptive lahars and fluvial reworking. The possible implication for the presence of the syn-eruptive lahar is thin and fine-grained deposits described here as a sole layer and/or ash cloud deposits underlying the main body of the October lahar deposits in the upstream area of the Akagawa River (Loc. S119, 1192, and 1191). However, distinguishing these deposits from the October lahar deposits is difficult due to the lack of direct observation immediately after the syn-eruptive lahar. 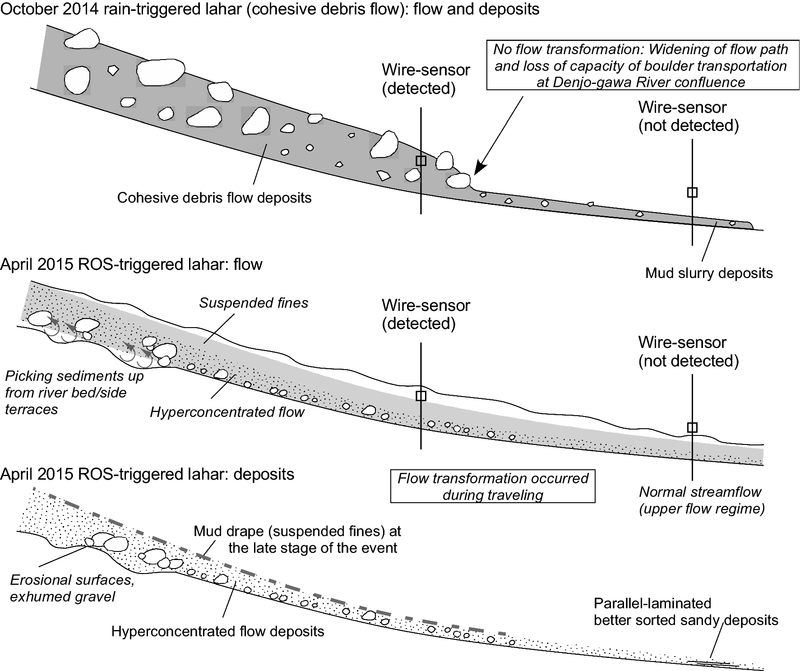 The October rain-triggered lahar deposits described in Sasaki et al. (2016) are gravelly and not muddy indicative of the April ROS lahar or fluvial deposits (Figure 5f in Sasaki et al. 2016). This also indicates that part of facies and compositional descriptions (petrography and mineral assemblages) as well as grainsize data of the lahars and their deposits described in Sasaki et al. (2016) needs to be reconsidered and carefully cited. Rather than the syn-eruptive lahar, other two post-eruptive lahar events described in the present study were more significant to the river system and hazardous in terms of long runout and volume of deposits. The October 2014 lahar was triggered not by the first rainstorm, but by the second rainstorm associated with a typhoon on October 5 when for the first time > 10 mm/h precipitation was recorded after the eruption. The delayed response is probably due to the characteristics of ashfall of the 2014 eruption. Very high clay content (32–36 wt%) and the presence of clay minerals in the September ashfall deposits (Fig. 6d and Table 2 and Table 3 in Appendix 1) are due to hydrothermal alteration of source material. The clay-rich nature resulted in resistance to erosion of the cohesion ash surface (Wischmeier and Smith 1978; Goldman et al. 1986) by the first rainstorm event, with peak intensity of 6.9 mm/h and total 52.5 mm precipitation. The physical properties of eruption deposits constrain permeability and erodibility of surface exposures (Pierson and Major 2014). Nomura et al. (2003) discussed that a similar cohesive ash-covered landscape suppressed lahar initiation after the 2000 phreatomagmatic eruption at Mt. Usu. In contrast, the 2008–2009 magmatic eruption at Chaitén volcano produced granular primary tephra which was cohesionless and susceptible to erosion. The ashfall over hillslopes was easily eroded with small precipitation (20 mm per day), causing a lahar and acute sedimentary response to rainfall events (Pierson et al. 2013). Due to the October 5 rain and lahar event, most of the primary sediments in upslope area were swept away (Fig. 3a, b), which could lessen the opportunity to generate other rain-triggered lahars in the same rainy season. 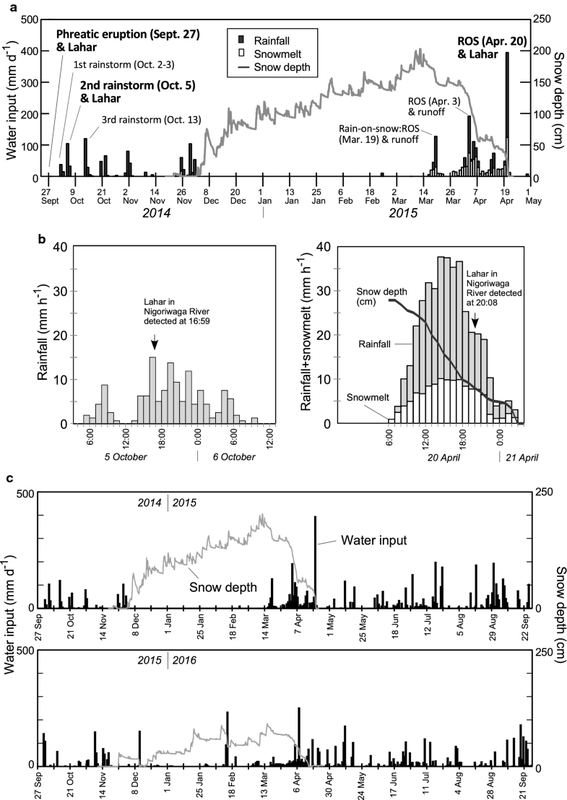 Indeed, other heavier rainfall and ROS events with cumulative rainfall + snowmelt > 100 mm after the October lahar event could not trigger any significant lahars in the river system until the last ROS event on April 20, 2015, with rainfall and snowmelt totaling 332 mm immediately prior lahar (Fig. 2). Despite the similarity of geomorphological and hydrological features of the Shirakawa River and Akagawa River as well as the ashfall deposition that was also observed in the Shirakawa River headwaters, there were no lahar deposits along the Shirakawa. In contrast to the Shirakawa River, the head of the Akagawa catchment hosts the active volcanic vents, suggesting that deposition of pyroclastic density current deposits and 10s-cm-thick proximal pyroclastic fall deposits was critical for lahar generation in the Akagawa River. The isopach map for the pyroclastic fall deposits by the September 2014 eruption (Fig. 1a) also suggests that headwater catchment of the Akagawa received 2 × 105 m3 of ashfall, whereas ashfall deposited in the Shirakawa headwater is only 2 × 103 m3. Thus, the Shirakawa River catchment was less impacted by the eruption. Visible amounts of pyrite and native and/or precipitated sulfur in the October lahar deposits, along with the extremely high sulfur contents and diagnostic clay mineralogy, indicate that the lahar deposits were derived from remobilized 2014 eruption deposits, which included hydrothermally altered materials. Clay minerals such as smectite and kaolin group minerals and the unusually high clay content in deposits definitely contributed to the viscosity of the flow (Hampton 1975; Pierson 2005). Even after selectively depositing large clasts at the confluence of the Denjogawa River, the fine part (i.e., matrix part) of cohesive October lahar was able to travel longer distance without flow transformation because high viscosity can damp turbulence (Baas et al. 2009, 2011) and hamper dilution of the lahar with river water (Fig. 10). The ROS-induced lahar on April 20 was the largest flow event during the snowmelt season in 2015 in the Akagawa and Nigorigawa Rivers. The conditions were most conducive for generating a lahar. Contributing factors include (1) the very high rate of water delivery to the catchment (rain plus snowmelt), (2) the availability of a supply of older loose sediments, in addition to those remaining after the 2014 ashfall and lahar, and (3) new exposures of these available sediments following removal of snow cover at almost the end of the snowmelt season. The ROS-triggered lahar on April 20 was caused by the largest rainstorm during the 24 months after the eruption (Fig. 2c), resulting in the total water input (rain + snowmelt) of 398 mm. The warm, moist, windy conditions during ROS events produced substantially higher energy for snow melting which came from sensible and latent heat exchanges (e.g., Marks et al. 1998, 2001). Debris flows and significant floods triggered by the augmentation of water input to a hydrological system under the ROS situation have been previously reported in other volcanic and non-volcanic regions (e.g., Marks et al. 2001; Sobieszczyk et al. 2008). In contrast to the October lahar, the ROS-triggered lahar was dilute due to (1) large total water input resulting in high discharge of the flow, (2) the shortage of slope-covering and valley-confined primary eruptive deposits, most of which already was removed by the October lahar event, and (3) the paucity of clay in the flow. The dilute lahar was erosive during travelling so that it was able to incorporate the October lahar deposits in the valley as well as gravelly river and terrace deposits (Fig. 10). This is supported by the sedimentary composition of the ROS lahar deposits which consist of fines-poor sand and gravel, rich in rounded pebbles and cobbles originating from preexisted fluvial deposits, as well as sediments derived from the October lahar deposits. The initial flow could not entrain enough sediment to turn into debris flow. It evolved instead into hyperconcentrated flow, which finally (by deposition along its flow path) transformed into normal streamflow at the distal locality (Fig. 10). The ROS conditions causing cohesionless debris flows and/or hyperconcentrated flows in volcanic regions have been documented previously (Pringle and Scott 2001; Sobieszczyk et al. 2008). Mud drapes on the sandy or gravelly ROS deposits indicate condensed suspension fines, which is typical of hyperconcentrated flows (Pierson 2005). Thickness of snowpack over sediments/rock was also a significant factor to generate a ROS-triggered lahar. There were other two ROS runoff events (on March 19 and April 3) resulting in stage changes in the rivers in the snow season (Fig. 2a). However, these two events did not generate a lahar. Although the ROS situation on March 19 and April 3 enhanced snowmelt too, there was still a > 1-m-thick snowpack on upper slopes after the ROS events (Fig. 2a), suggesting most of the available sediments were still covered with snow. In contrast, only a 10-cm-thick snowpack was recorded 2 h before the ROS-triggered lahar generation on April 20 (Fig. 2b). These indicate that sediments were newly exposed after the removal of snow cover, and consequently, combined with other factors, the condition was favorable to generate a lahar in the end of the snowmelt season. At permanently snow-clad volcanoes, eruption-triggered lahars with snow and glacier melting can pose serious lahar hazards, for example, the 1985 eruption of Nevado del Ruiz (Pierson et al. 1990). 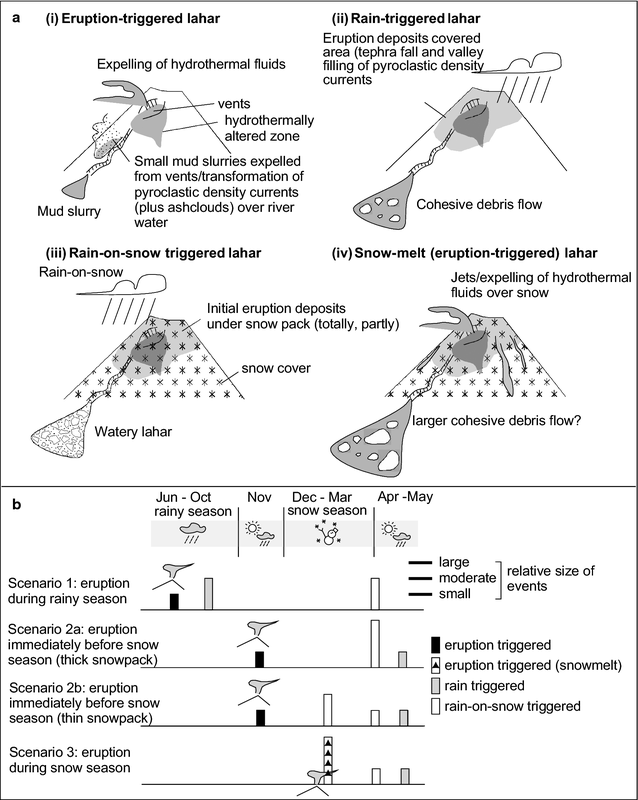 However, a snow-clad volcano with “seasonal snow/ice” such as Ontake Volcano has complex lahar-triggering and driving factors such as rainfall, snowfall, and snowmelt which vary in the seasons (Fig. 11a). The Ontake 2014 eruption aftermath clearly shows that the timing of eruption (i.e., whether it occurs in the rainy season, snow season, or snowmelt season) can affect flow types and size of lahars (Fig. 11a(i), (ii), (iii), and Scenario 1 of Fig. 11b) and suggests the predicted scenarios for lahars (Scenarios 2 and 3). Although at Ontake Volcano, post-eruptive lahars may occur during the rainy season, a ROS condition especially at the end of snowmelt season should be much more hazardous because of the compounding effect of rainfall and meltwater, whereas during the snow season, the availability of sediments, to be picked up and transported by surface water runoff, decreases because of thick snow accumulation over the deposits. It is assumed that if the 2014 eruption had happened at the end of the rainy season and before the snow season (Scenario 2a), then primary eruption deposits on slopes as well as pyroclastic density current deposits confined in the valley would have been stored under the snowpack. Eventually, a ROS-induced lahar could have been larger than the October rain-triggered lahar and the April ROS-triggered lahar, with an end-of-season sudden release of eruption deposits stored on upslope areas. The snow season in 2014/2015 was characterized by conspicuously thick accumulation of snow in contrast to the next year (2015/2016) which had less snow (Fig. 2c). If there were lesser snow accumulation after the eruption of Ontake, rain could occasionally have occurred instead of snow during the snow season, which could result in several small ROS-induced lahars (Scenario 2b). The ROS situation is common at Ontake and was not unique during the year 2014/2015 (Fig. 2c); however, there are no reports of other ROS-induced flood and debris flows and their deposits, which influenced the Nigorigawa River catchment. This denotes that the potential of (1) the initiation of a ROS-induced flow event and (2) preservation of ROS-related deposits can be higher only when an explosive eruption “adds” excess eruptive and sedimentary materials on surfaces. Syn-eruptive lahars associated with snow-melting water at Ontake Volcano have not previously been observed, nor reconstructed from geological records. However, this type of lahar would probably be on a larger scale and would be destructive (Scenario 3) because of the climate condition during winter with several meters thick snowpacks at high elevation (> 3000 m). The existing lahar hazard maps for Ontake Volcano include an assumption of potential lahars by snow melting or by heavy rainfall with a return period of 100 years following a magmatic eruption. However, potential hazards by lahars may delay in response to variable climatic conditions because thick snow packs over tephra fall deposits can prevent erosion and remobilization. Under such conditions, lahars will be large when they are associated with ROS events during a snow-melting period. Thus, the variable lahar scenarios should be considered and some of the hazard mitigation strategies for lahars should be re-accessed and revised especially at active volcanoes under a temperate climatic condition with seasonal snow cover in Japan. The clay-rich October lahar deposits of Ontake Volcano clearly indicate that a cohesive lahar (debris flow) can be generated following a small-scale (VEI 1–2) phreatic eruption solely by rainfall without large-scale flank collapse. In addition to this 2014 example, a rain-triggered lahar after the phreatic eruption at Ontake in October 1979 (Okuda and Kashiwaya 1980) was noted to have had a texture and depositional facies similar to the October 2014 lahar (personal comm. by Hiroshi Suwa). Several other reports suggest that cohesive lahars (or muddy flows) can occur after/during phreatic eruptions, based on modern examples (Mt. Niigata-Yakeyama 1949 eruption, Sakuma and Minakami 1949; Mt. Yakedake 1962 eruption, Yamada 1962; Mt. Ruapehu 2007 eruption, Graettinger et al. 2010; Kilgour et al. 2010), implying the close relation between small-scale phreatic eruptions and the clay-rich or clay-bearing lahars. Since clay-rich lahar deposits usually are expected to derive from large-scale debris avalanche associated with flank collapse (Vallance and Scott 1997; Capra and Macías 2000; Waythomas 2006; Vallance and Iverson 2015), this interpretation of origin should be verified using geomorphological evidence: amphitheater scars on edifices, distributed hummocks in downslope deposits, and very large volumes of lahar sediments. 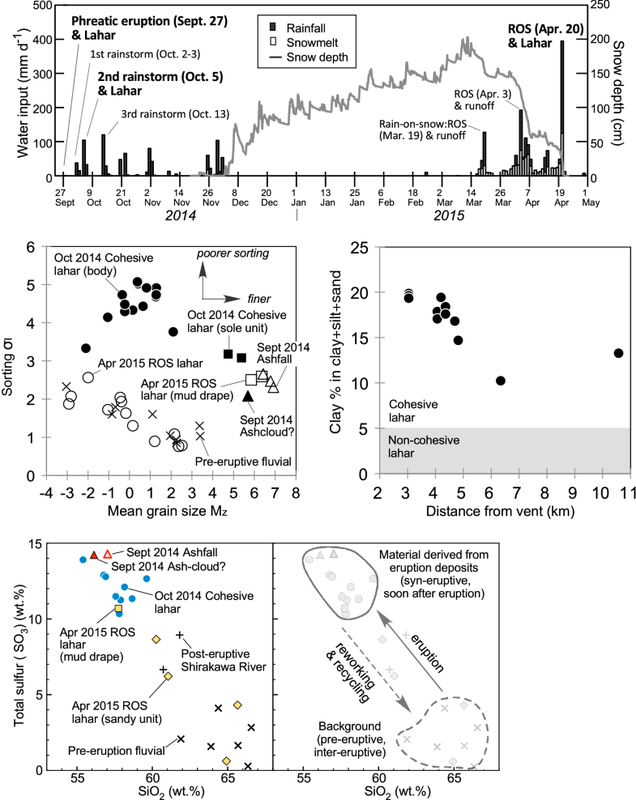 Mineralogical aspects (especially clay mineralogy) of clay-rich lahar deposits in association with debris avalanche often relate the origin of collapsed edifice to states of hydrothermal alteration (John et al. 2008; Detienne et al. 2017). Mineralogical and geochemical characteristics of the rain-triggered October lahar deposits at Ontake inherit information about hydrothermal alteration conditions without flank collapse. The October lahar deposits show enrichment in sulfide and sulfate minerals (Table 2), which correspond with the state of the hydrothermally altered source area. The presence of pyrophyllite in the lahar deposits, which is also one of the characteristics of the September eruption deposits, suggests the material originated from a hydrothermally altered zone at 1–2 km depth below the surface of the volcano (Minami et al. 2015), not from the edifice. Phreatic eruptions tend to be in a smaller scale compared to magmatic eruptions, and therefore, traces of these eruptions are limited to proximal (summit) areas and are prone to be eroded soon after the deposition. Indeed, when the authors climbed up to the summit area of Ontake Volcano 12 and 22 months after the eruption (at Loc. 1289: Fig. 1a), initial ashfall deposits had been largely eroded and removed by wind, rain, and snowmelt processes. This implies the incompleteness of the geological record in documenting small phreatic eruptions. 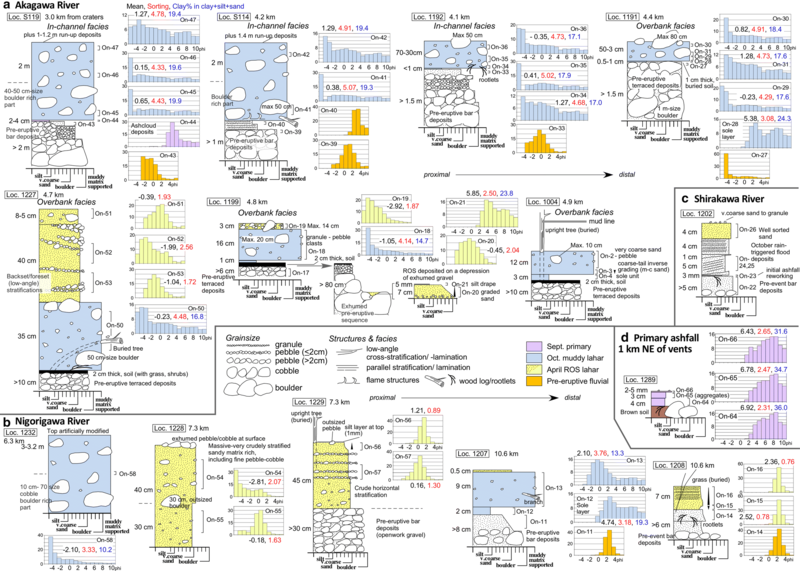 Understanding the history and recurrence intervals of phreatic eruptions at Ontake and other volcanoes is difficult, because most of the examples are from witnessed events (Soya et al. 1980; Browne and Lawless 2001; Ohba et al. 2007; Fujinawa et al. 2008; Kilgour et al. 2010), and there must be more unknown phreatic eruptions. Although the reconstruction of phreatic events by geological records is necessary to predict and mitigate future hazards, the low preservation potential of primary eruption deposits often hampers orthodox tephrochronological methods to apply and reveal phreatic eruption histories. On the other hand, meters-thick October lahar deposits at Ontake can be a substitute of the eruption deposits as they partially retain primary eruptive information. Similar clay-rich lahar deposits with distinctive compositions in geologic and stratigraphic records have been reported in previous studies, in relation to lahars after phreatic eruptions and/or derivation from hydrothermally altered rocks nearby eruptive sources (Hodgson et al. 2007; Kataoka et al. 2015; Minami et al. 2015). At Adatara Volcano in northeast Japan, more frequent intercalations of lahar (cohesive debris flow) deposits than those of recorded eruption deposits suggest the presence of unknown eruptions of the volcano causing the lahars (Kataoka et al. 2015). The examination of lahars at Ontake and other volcanoes in association with phreatic events implies that clay mineralogy of lahar deposits is useful to assess the presence of unknown small-scale eruptions (Cronin et al. 1997; Hodgson et al. 2007; Kataoka et al. 2015). In addition, the whole rock sulfur contents of lahar deposits are also helpful for distinguishing the syn-eruptive and/or earlier post-eruptive deposits from deposits in inter-eruptive, background sedimentation periods in geological records (Fig. 8). Some of the overbank or in-channel lahar deposits might be well preserved when river course changes or sudden aggradation occurs by subsequent eruption and lahar deposits. Therefore, clay-rich lahar deposits must be important not only for unraveling a lahar history, but also for evaluating the frequency of small-scale eruptions, which are otherwise unaccounted for. Such documentation is needed for volcanic risk assessments for populated cities/towns located at the foot/downstream of the volcanoes. In association with the September 27, 2014, phreatic eruption at Ontake Volcano, one syn-eruptive lahar and two post-eruptive lahars (a rain-triggered lahar on October 5, 2014, and a ROS-triggered lahar on April 20, 2015) occurred on the southern flank of the volcano. The October lahar was triggered by the first rainstorm after the eruption having > 10 mm/h precipitation, which was the second post-eruptive storm. The lahar was a cohesive debris flow that travelled 11 km and formed very poorly sorted, massive clay-rich deposits (10–20 wt% of clay in matrix, 2.9 × 105 m3 in volume). Most of the deposit originated from hydrothermally altered eruption material deposited near the vents, on slopes, and in valleys at the head of the catchment. The April lahar was caused by the last and largest ROS event during the snowmelt season. The lahar flow was erosional in upstream reaches, due to vigorous bank and channel erosion that exposed older pre-event deposits. The ROS-triggered lahar left hyperconcentrated flow deposits in the upstream areas and normal streamflow deposits in the lower downstream areas, suggesting flow transformation. The ROS-induced lahar deposits are fines-depleted sandy gravels and gravelly sands, derived from fluvial gravel in the river channel, terrace deposits, and October lahar deposits. The present contribution reveals that the deposits and samples of the syn-eruptive lahar in Sasaki et al. (2016) were incorrectly described as those obtained from the rain-triggered October lahar. Therefore, the volume, thickness of deposits, travel distance, sedimentary characteristics, and components of the syn-eruptive lahar as well as the October lahar in Sasaki et al. (2016) should be reconsidered and carefully cited. The recognition of the syn-eruptive lahar deposits must be difficult because they were nominal volume of deposits, and possibly, they could have been buried and eroded by the following two post-eruptive lahars. Despite these lahars having originated from the same volcanic source within 7 months after the eruption, triggers, behavior, composition, and deposits were totally different. This is due to the proportion of water input to available sediment, controlled by rainstorm intensity, snow accumulation on slopes, rate of melting, and the availability and erodibility of volcanic deposits in valley and slopes which sometimes are covered with thick snow packs. This means that the generation, size, and types of lahars can vary with the timing of eruption, whether it happens during the pre-snow season, snow season, or rainy season. Therefore, lahar hazard assessment at Ontake as well as many other Japanese “seasonally” snow-clad volcanoes should include lahar scenario models with regard to seasonal variation. Among them, the ROS triggering of lahars is a significant process for lahars remobilizing primary deposits and posing potentially large hazards. Good preservation potential for the clay-rich lahar deposits, like the October 2014 deposit, provides a way for geological sections to be evaluated to better reconstruct the history of phreatic eruptions. Frequent but small-scale phreatic events spread primary deposits, usually limited to proximal (summit) area, that are prone to erosion by wind, rain, and snowmelt runoff, which can pose difficulty understanding the precise eruption histories. Clay-rich lahar deposits can contain high bulk sulfur contents, sulfide/sulfate minerals, and clay minerals diagnostic of alteration processes at depth. Such lahar deposits are often overlooked in favor of primary eruption deposits, but they may in fact preserve a better record of small-scale eruptions. KSK did field survey for sedimentological analysis and did contribute to write the main part of the paper and compile/interpret data. TM was engaged in river morphological survey and analyzed snowmelt water estimation. TS did field survey for petrological analyses. KK, TI, AS, and KS contributed to snow and meteorological survey for the study area. YN performed the geochemical analysis for the sedimentary samples. All authors read and approved the final manuscript. The authors are grateful to Kazumi Nakajima and his colleagues at the Forestry Agency, Kiso Office, for giving helpful information to do fieldwork. Koji Suzuki (Niigata University) is thanked for logistic and technical support for setting up of observation sites. Takuma Katori (Niigata University) helped us with mineral identification and XRD analysis. Analyses of XRF and laser grainsize were performed with the help of Midori Momiyama (Fukushima University) and Sanae Watabe and Keiko Yamagishi (Niigata University). Discussion with Fukashi Maeno (University of Tokyo) helped in the interpretations of original material within lahar deposits. Hiroshi Suwa (Kyoto University) is acknowledged for providing (some unpublished) information about a lahar occurred after the 1979 eruption of Ontake Volcano. The authors appreciate and acknowledge Thomas Pierson (US Geological Survey) and Christopher Gomez (Kobe University) for their thoughtful reading and constructive comments, which greatly improved the manuscript. This research is fully supported by the intermural research grant: the institutional research fund at the Research Institute for Natural Hazards and Disaster Recovery, Niigata University, in FY2014 (PI: KSK, co-PI: TM) and the collaborative research grant provided by the same institution in FY2014–2015 (PI: TS, co-PI: KSK). 40623_2018_873_MOESM1_ESM.mov Additional file 1. A movie, captured by a camera set at Loc. 1227 in the Akagawa River with 10 min intervals, showing rising and falling stages of the rain-on-snow-induced lahar that occurred on April 20, 2015. Records start at 5:00 a.m., April 19 and end at 9:00 a.m., April 22. The peak, which occurred at night, could not be captured.